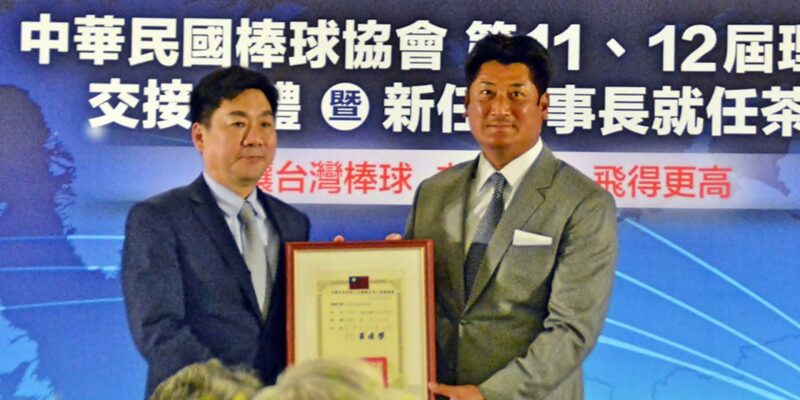 TAIPEI 29/06/2018– Jeffrey Koo Jr., owner of the Chinatrust Brothers in the Chinese Professional Baseball League (CPBL), was inaugurated today as the new president of the Chinese Taipei Baseball Association (CTBA), beginning a four-year term to 2022. Many top government officials and baseball leaders — including CPBL Commissioner John Wu, Baseball Federation of Asia President Tom Peng and Baseball Federation of Japan President Masatake Yamanaka — gathered at the Mandarin Oriental to witness the formal inauguration. Baseball legend and home run king Sadaharu Oh also sent his congratulations via video message. Koo replaces Liao Cheng-ching as the 12th president in CTBA history. The new CTBA leader and CPBL club owner is also a major shareholder of one of Taiwan’s biggest privately owned financial institutions, CTBC Financial Holding. Baseball is the top spectator sport in Taiwan and the Chinese Taipei National Team is currently ranked No. 6 in the WBSC Baseball World Rankings.